Maybe your refurbishing your home? Or you’d just like to find some unique and original door hardware, and at an affordable price too? Or perhaps your business premises need to be brought up to date? Take a look at online store, Love Handles. Love Handles are suppliers in the best of architectural door hardware-that’s door handles, door locks and any other door fittings to me and you! All of Love Handles employees are trained through the Guild of Architectural Ironmongers Education system, meaning if you have a query, they’ll be able to help you, whether your unsure which lock would provide you with the most security for your home or perhaps you need to know more about the legislation that you will be required to meet if you are purchasing door hardware for a business, the Love Handles team will ensure you get the right product. Due to the diverse client base that Love Handles has, stretching from private home owners to large companies, our product range is sourced from all around the world and all in a huge variety of styles. So, whatever your needs-Love Handles has the solution. As well as providing products for the house owner, they also have a number of business clients, too. The New Hilton Hotel in Liverpool and the ubiquitous Urban Splash development-Chimney Pot Park in Manchester are just two of the projects that have the Love Handles mark on them! If you don’t need any advice and you’d just like to buy online, go ahead! Next day delivery is free and this covers the whole of the UK. However, if you’d like to speak to an assistant about a particular query, head across to their Design Centre in Liverpool where they will be more than happy to help. 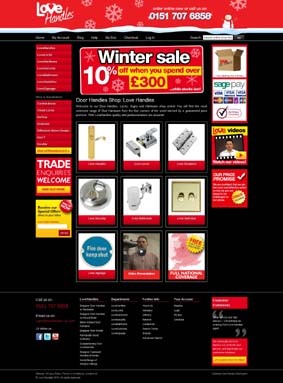 Visit the Door Handle Shop now!